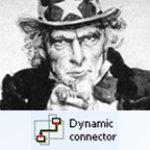 I Want You, Dynamic connector! When I’m creating Visio-based graphical solutions, I frequently run into the situation where I want to send all of the connectors on a page to the back. 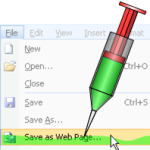 There are a number of reasons to do this, but more importantly for Visio Guy readers, there are a number of ways to do this! In today’s article, you’ll learn a number of methods to select shapes by type or layer, and you’ll see a little bit of VBA code that will help you automate the task! Don’t you hate typing Property Get and Property Let and Property Set into your VBA class modules over and over and over and over? Today I’d like to share a little VBA code module that I like to use to generate VBA class properties. If you need to know how Visio shapes are glued together, and how to traverse paths through a process flow diagram, then this article is for you. You’ll learn about glue types, connector ends and order-of-connections. 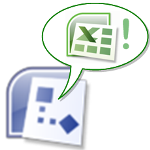 A beautifully formatted document, with accompanying VBA code will help you to better understand…your processes! If you’re trying to take Visio to the next level by writing code for custom solutions, then you’ve likely run into some aspect of connections. 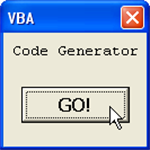 The well-commented VBA code (provided by guest-poster Al Edlund) which accompanies this article will help you make programmatic sense of the elemental stuff of connected Visio diagrams: connectors, connection points, OneD shapes, Connect and FromConnect. 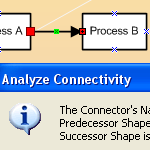 You’ll also see how to produce connected diagrams, find out which shape is connected to which, and more importantly, do some path analysis to find the deeper meaning behind it all! Today, we continue with the movie-trilogy theme, but concentrate on advanced tips for importing and working with multiple shapes automatically. This is the third and final piece in our trilogy of articles on Visio data graphics and data-linking. Hey football/soccer fans! We’ve got an update to our automated smart drawing for this years European Cup soccer tournament. Well, that version needed a few updates, most notably, the handling of games that are resolved with penalty-kicks, or shoot-outs. 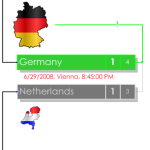 Visio is a natural choice for creating brackets for sports tournaments. 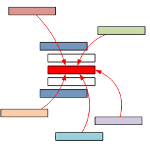 I have seen many elimination-tournament diagrams created in Visio over the years. In fact, just a few years ago, a very nice example was done for the 2006 World Cup. 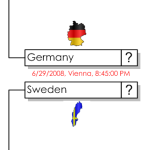 You can get it at Office Online here: 2006 World Cup Bracket. But the trouble with these diagrams is that they require *gasp* manual input of data, or user-movement of shapes. The horror!